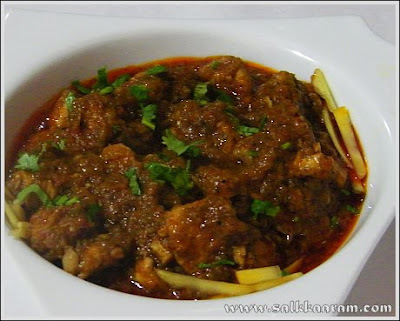 Lahori Murgh / Lahori Chicken | Simple and Delicious ! Grind onion and green chillies in a grinder to make a coarse paste. Heat oil, saute onion and green chilly paste. When the color changes slightly, saute garlic and ginger paste too. Add chicken and tomato along with powders and salt. Pour little water enough to make chicken cook. Cook until the chicken is done and you get a thick curry. Serve hot with ginger julienned and coriander leaves. Wowo looks super delicous, i am sure bookmarking this one and gonna make them one of these days. 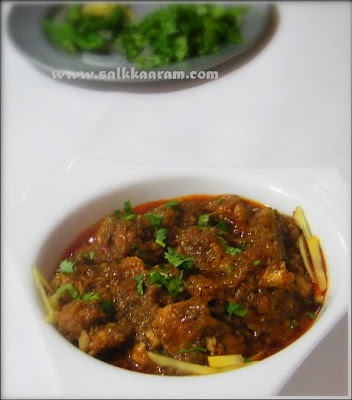 I am always looking for new chicken and mutton recipes. Looks delicious! Looks yummy. Would you have Lahori vegetarian recipes too? thank u seena for d pakistani dish. i hv new facebook friend who is very much attached to this kind of varieties. i shall send her d linik. saadhikkathe kidakkunna oru aagraham undu.! Besides Kashmiri Chilli powder what other powder can i use since i can't get the said chilli powder. Becky, You can use paprika powder instead. Thanks for the recipe. The curry turned out to be good. but I feel there was some row taste of onions still in the gravy. should I saute onion-chilly paste for more time? also the paste was smooth and not coarse. does it alter taste or gravy?